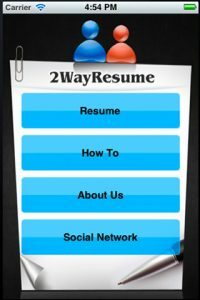 Developed by Advancing Women, 2WayResume is a CV creation app that features easy-to-construct resume templates and harnesses the power of your social networks to land that next big job opportunity. The app is straightforward and easy to use, with a streamlined interface for easy navigation. To get started simply tap ‘resume’ on the main screen. This takes you to the ‘Create Resume’ page where you can input your personal data, including specifics such as name, address, phone number and email, career/job objectives, experience, education, skills, awards & recognition and any publications. 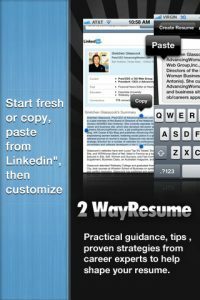 2WayResume features easy-to-follow “How-To” which explains the basics of using the app as well as highlighting the importance of creating a relevant resume, tailored to the job being applied for. 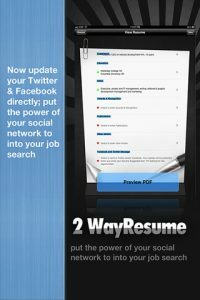 The app allows you to share your newly-created resume via email, Facebook or Twitter, thereby expanding your job opportunities. 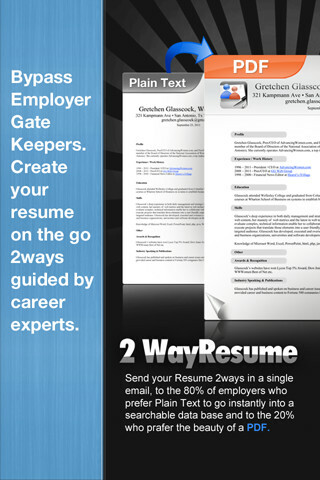 2WayResume can store up to 8 different resumes, each of which can be targeted to a different employer or job description. 2WayReume is compatible with iPhone, iPod touch, and iPad. 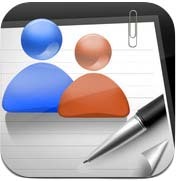 Requires iOS 4.0 or later. A small expedite fee was paid by the developer to speed up the publication of this review.